Red Bull Spot Supply sheds light on a cast of characters, builders, and skateboarders in VA.
Before public skate parks, muti-million dollar skate events and skate moms, skateboarding thrived solely on the energy of those who owned a board. Red Bull Spot Supply sheds light on the cast of characters, builders, and skateboarders who start with nothing and don’t stop building until there’s something to shred. Three DIY skate collectives were given the supplies to create something new at their spot. 660 Ramp in Jersey City, South Philly Bowl in Philadelphia, and Lost Bowl in Richmond all got on board and were up to the challenge to build something new over the summer. In order to make it interesting, the Red Bull skate team votes on which spot gets the most mileage out of what Spot Supply kicks down to each collective. The winning team walks away with extra cash to get through the winter. First up, the Lost Bowl in Richmond Virginia. 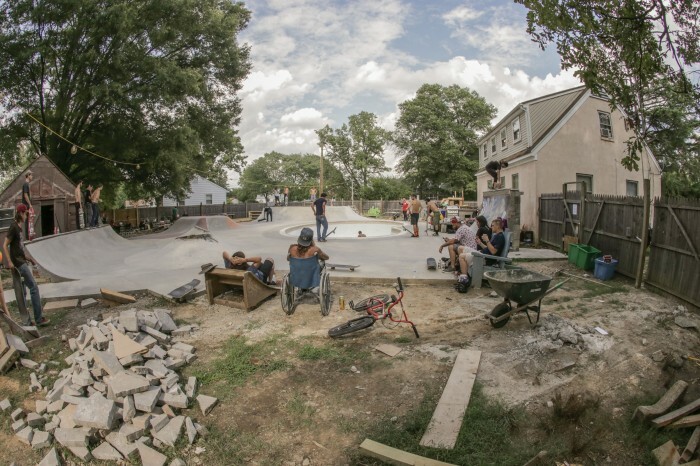 When Pat Lowery built his own backyard haven in post-recession Virginia, he wasn’t all that concerned with budgets, project management, workflow, or even quality concrete work, but with a few close friends, the Lost Bowl became the destination spot in Richmond. What started as a few features here and there has turned into an entire backyard skatepark – designed and built by some of the best in the business, aka Berny Mcgrew, who’s poured concrete for skateparks across the country. Richmond now has one of the most inclusive facilities going, and each weekend you can find a crew of 10-50 skaters ripping the transitions. The Lost Bowl has become such a great meet up spot that they’ve even started hosting skateboarder friendly yoga sessions. At the end of the day, cities like Richmond have rough ground and hot weather. They’re not the center of any part of the skateboard industry, and local governments are slow to come around to the positive role skateboarding plays in people’s lives. They’ve had cheap skateparks and short lived street spots, but some of the biggest hearts when it comes to DIY transition and good friends. The Lost Bowl might be one of many DIY spots in RVA, but its certainly the most iconic and inviting skateable swimming holes south of the Mason-Dixon. Hey, Im from Chicago Illinois, and go to school in Radford. Was wondering where this spot is?